Ever since we moved here, the carpet by the front door has had some weird stains on it. They weren't there at first since they'd had the carpet professionally cleaned, but it still felt kind of ... sticky? Well, that caused dirt to accumulate even faster I guess and the stain reappeared pretty quickly. A Rug Doctor was no help, especially after the dogs decided it was OK to relieve themselves there instead of coming to ask to go outside. (Still don't know what made them stop being housetrained all of a sudden). 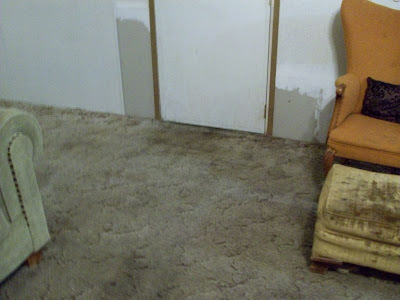 The walls around the door near the stain were damaged and the drywall had to be replaced. There are quite a lot of evidence of violence in the house from fist sized holes in the walls to doors being gone and just hinges remaining, to the door jam of the master bedroom being obviously kicked in, and the window in there was shattered. There are also odd faint red splatters on the walls that I swear remind me of CSI episodes, but Hubby says I'm nuts. Anyway, those things make the odd not-going-away stain in front of the door with the damaged walls... very suspicious. SO! I ripped it out! The stain went all the way down to the plywood underneath. That's kind of creepy and gross really. I had been looking around the Lowe's website for flooring ideas and found something awesome. 4"x36" fake wood planks and they're VINYL! I love it! Vinyl means dog pee-proof (and cat for that matter). They even say waterproof as a reason to buy them. So, I went to our local Lowe's and came home with a bundle. They're only 99 cents a piece! And they're peel and stick! YES! I got the utility knife and cut out basically a square right in front of the door the size of 8 of the planks side by side. 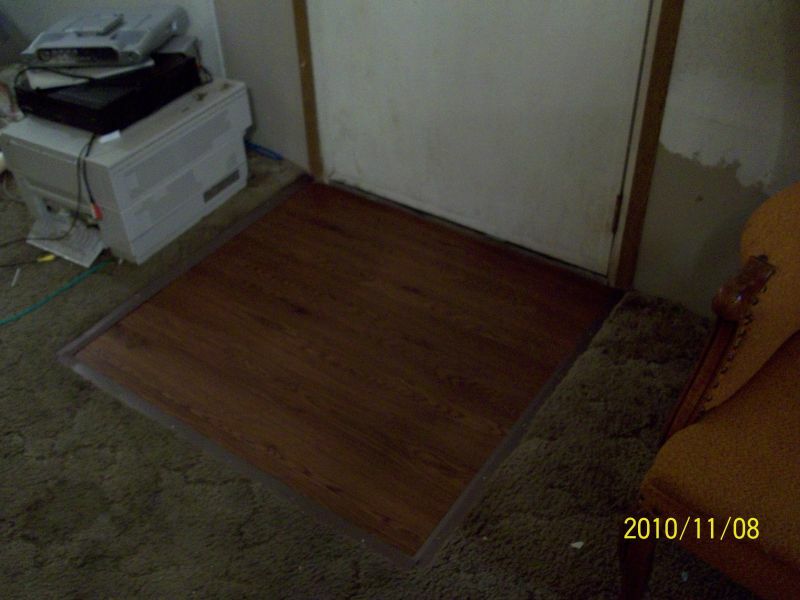 It was so good to see that carpet gone, even the bare plywood was an improvement! Then I pulled up the staples, swept, vacuumed etc and got it all ready. I knew it should have an underlayment, but this is just a temporary thing to get rid of the nasty carpet for the time being... so I stuck the planks right to the plywood. Normally, they are offset to give the whole hardwood floor look and to make sure seams aren't next to each other, but since this is just one square for now, I laid them side by side trying not to get the same grain ones next to each other. It was an immediate improvement! I really love this product too. I researched it online and there's tons of posts on forums raving about the stuff. The only thing anyone had to say negatively about it was sometimes the glue can smell for a couple days. Otherwise they all love it. There's a concern on the forums about how it affects resale value in a house, but I don't plan on selling this place. This February when we get our tax refund, I want to take some of it and have the carpet in the living room and hallway ripped out and a 1/4" plywood underlayment put down and then do the whole area in these peel and stick planks. It'll be rough on knees, hands and backs, but so so worth it! I do prefer carpet in the living room, but with these animals, the vinyl is simply a smarter choice. (One of our cats, Pepper, is getting old and has accidents, plus the neurotic dogs pee if you look at them funny.) Maybe we'll get a 5x7 rug for the living room area or something for sitting on the floor watching TV. It'll be really nice to have the vinyl under the dining area for easy cleanup there. Here's the after pics. Sorry they're dark. I do work nights so that's when I tend to take my pics and blog as well. I just realized how dirty my door is! Have to scrub that, sheesh! Also, don't look at the pile of weird electronic devices such as a copy machine. They're going to the charity thrift store. Doesn't this look so much better? And it looks like real wood! This is a shot with the door open. It swings open so easily now. It used to drag on the nasty carpet. 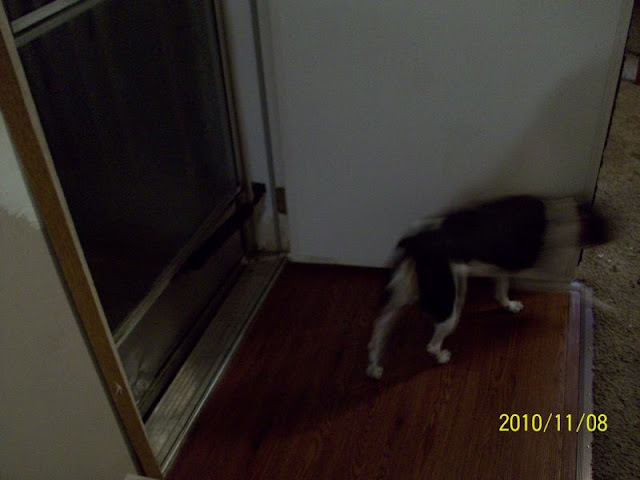 Sophie is running away from the camera. She looks guilty. The dogs actually haven't peed on the new vinyl floor, so YAY! They have come and asked to go out a lot more, so maybe this was a double-good project! Man I can't wait to paint those walls and replace that battered storm door. As for the decluttering weekend, well... it's sort of coming along. Saturday night I had to work for a co-worker who had to go to a funeral, so it kind of messed up my whole weekend. Hubby and I did tackle the gaming table in our bedroom. It was still pretty piled with odd socks, unfolded sheets (I hate folding those. ), and just various stuff. So, we took everything non-gaming related and put it on the bed. We decided then to go to Lowe's and then get something for dinner, then come back and work on the piles again. But then Zoe reminded daddy that he was supposed to watch How to Train Your Dragon with her, so we postponed it for a while. I did work on the non-game piles on my breaks at work this evening, and he's gotten some stuff in a box. We *should* have taken stuff to the storage unit today since it was warm and dry and I had Hubby home all day, but I slept so long, it kind of threw everything off. Oh well. we can work on it little bits this week I guess. He's off again Thursday, so he can help me haul stuff over then. We really do need to get that gaming area done though. We've been gaming at another couple's house which has been convenient for them since she had back surgery and couldn't ride in a car for several weeks. But she's getting better and wanting to get out more. And it's about time we switched campaigns to the one my Hubby runs. It's just easier to hold the game at the home of the Game Master, since he has to set up miniatures, terrain, the battlemats and all that. And since we've moved the gaming table to the big open space in our bedroom, the lady with back surgery can still lay on our bed when it starts to act up, and she can still play the game. It's right off the kitchen too, so I can set up snacks and drinks on the sideboard and dining table and they can access it quickly and easily. Plus we have the master bathroom right there. I am looking forward to hosting the games again, and it'll be nice to not have to drive all the way to their house this winter. It's 30+ minutes away, and sometimes the van heater doesn't work. Brrrrr! I'll take pics of the game area when it's done. We want to put some of his favorite art from the magazines and poster maps etc on the walls, but I really want them to look nice, not just like some teenage geek's room LOL! Might take them to Staples to get them laminated and then frame them or something. We'll see. Since I "gave" Hubby half of the bedroom for his man cave, I think it's only right that he can decorate it as he likes. I'm just kind of happy not to have all the gaming stuff in my living room! Well, that's it for now. Just wanted to show off my new little square floor hehe. Have a great week y'all. I'll try to post again soon and get back to Operation Declutter! I'd like to rip all of our carpet out and put something else down. I bet your LR will look awesome once you put your new floor down.